I got a chuckle out of the sentiment expressed in this 110 year old post card: “Being Good is Such A Lonesome Job.” Do you agree? Expect to come home either tomorrow P.M. or Wed. A.M. How does this card strike you? At the top there appears to be a postscript of sorts, perhaps written after E.L wrote the main text, and after she received a letter from George, mysteriously describing a cat worthy of sympathy for some reason. Just got your letter (Ha! Ha!) the cat has my sympathy. Some quick Ancestry.com research suggest that there was a George B. Lamb and Elsie (Crothers) Lamb that lived in Traverse City in 1910. According to the census they lived at 222 West Ninth in Traverse City. Elsie and George appeared to be married on October 27, 1901. Elsie was 17 and George was 26. They were married in Kalkaska and lived in Rapid City, MI. All of the cities mentioned so far - Traverse City, East Jordan, Kalkaska, Rapid City - are all cities in the upper west side of Michigan’s Lower Peninsula. You could drive through all of them in an hour or two. If my research is correct, Elsie died young, on April 11, 1915. Here is a Find a Grave memorial for her. She is buried at Highland View Cemetery in Big Rapids, MI. Here is her headstone. I believe Elsie and George had a daughter, Marian Lucille Lamb in June of 1912, a few years before Elsie died. George remarried, had at least one more child, and died in 1947. George was a store clerk, perhaps at a department or furniture store. Someone with Elsie and George in their Ancestry family tree identified this photo as Elsie with her siblings, Wilburn and Bessie. Elsie was identified as being on the left. If you are interested in testing some of your genealogy research chops this would be a great story to investigate. There are LOTS of leads to explore on ancestry and other places. Here are some questions to think about during your research. What is the story about the cat? What sort of store did George work at? What do you think, wonder, and feel as you read about this story? Why was Elsie in Jordan City when George was in Traverse City? I think I have the right people here, but is it possible I’ve made a mistake? 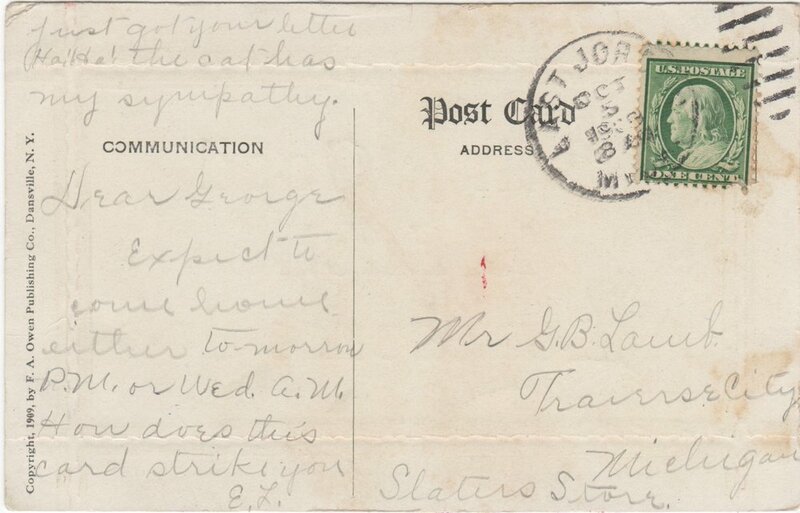 If so, who is the writer and receiver of the postcard? Is being good a lonesome job? Also, can you help me find any relatives of Elsie and George who might be interested in having this postcard as a keepsake?